The small town of Elkin is nestled in the rolling hills of North Carolina, just 25 miles from the Virginia border. It’s approximately 70 miles north of Charlotte and 40 miles west of Winston-Salem, convenient to both I-77 and I-40. 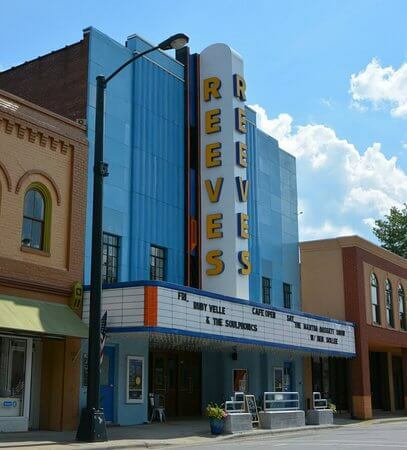 Parking is free throughout downtown Elkin for both shows at The Reeves Theater & "The Late Night HOOT" at Angry Troll Brewing. Part of Main Street (Corner of Bridge St to Church St) will be closed STARTING at 5pm for a block party to kick off the night in front of The Reeves Theater. From there, you will take a free shuttle provided by Hometown River Company a short distance to the Amphitheater. Chatham Park 600 E. Main St. Parking area will be designated by signage and traffic cones in gravel lots and along roads. NO CAMPING IS ALLOWED AT THE PARK. You may choose any open area in the plot labeled "Camping Area." NO ALCOHOL ALLOWED AT CAMPGROUND. If you have a camper or RV, contact our friends at Byrd’s Branch to see about any available spots they may have. They are filling up fast! Shuttles WILL NOT be able to come by the camp sites to pick up campers. Folks will need to make their way to the First United Methodist Church Parking for the festival shuttles and will be notified via signage when we switch to the overflow lot at Chatham Park. Please be mindful of other campers, clean up your trash, and respect the park during your stay. If planning to camp, please contact us to notify us of how many will be in your group and how many nights you’ll be camping! The Fairfield Inn and Suites in Elkin, NC is also a great supporter of Reevestock Music Festival and offers state-of-the-art guest rooms at a superior value for both business and leisure travelers. Elkin offers some really neat "Unique Lodging" options as well. From Cabins to Cottages, take a look at what we've got around! We will have several food vendors, and we'll provide updates closer to the event. There will be lots of libations - we'll provide updates closer to the event. No Outside food, drinks, or alcohol allowed. Enjoy our vendors. Thank you! No personal tents or canopies. There is plenty of shade around the venue. CASH ONLY – There is an ATM on site. Dogs ARE allowed – must be leashed and supervised at all times. Doggy bags must be used. If you fail to follow these guidelines you and your pet will be asked to leave. This is simply to ensure a safe and fun environment for all who attend. Thank you! The Kid’s Zone will have activities for children during the daylight hours of the festival. This area will close down later in the afternoon. Adult supervision is still required. This event will be held RAIN or SHINE! There is shelter if it rains.